YouTube One Channel Design requires a redesigning of your YouTube Channel for better branding. Here are links to official specs plus free PSD with guide to use. Older readers are aware that we always give updates and required PSD files for your designing for the major social networks like Facebook Timeline Template, New Google Plus Cover PSD. It was obvious that we will provide template psd for YouTube One Channel Design. Here we go. The best thing about YouTube One Channel Design is that, Google has provided quite clear documentation here – See the YouTube One Channel Design Specs. So actually you will require a 2560 X 1440 pixel image. They have provided a link in that webpage for downloading the PNG file too. It is actually intended for Adobe Fireworks. Most of us are used with Adobe Photoshop, it is actually a kind of standard in the field of designing for past at least 1.5 decades. What the PNG file can help us, it can work as a base template. All the top two Layers has some transparency. 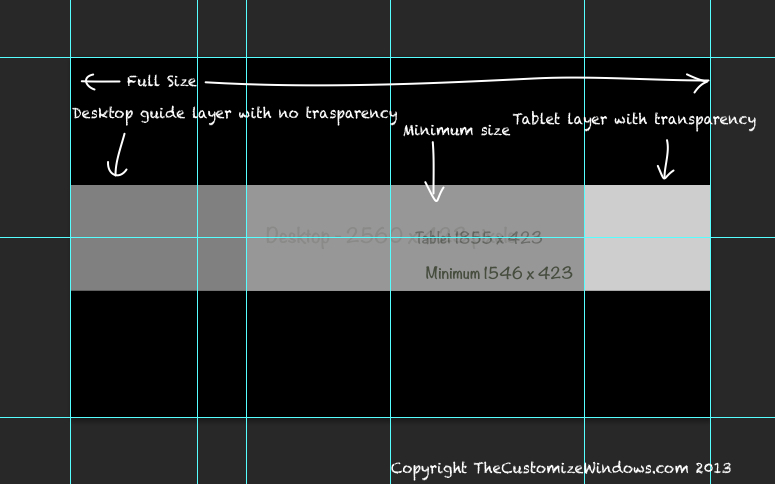 You can make one layer or two layers invisible to start working with the maximum size. Google’s designer wanted to illustrate in an way, that is actually not the standard in designing, it actually has became an illustration. What so ever, we should be thankful to Google for providing the right dimensions for YouTube One Channel Design, otherwise we could not create it. Download is available on my deviantArt. This Article Has Been Shared 7527 Times! Cite this article as: Abhishek Ghosh, "YouTube One Channel Design Guide With Free PSD," in The Customize Windows, May 23, 2013, April 21, 2019, https://thecustomizewindows.com/2013/05/youtube-one-channel-design-guide-with-free-psd/.